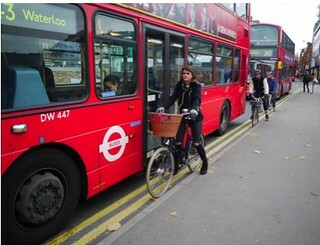 … the Theobald’s Road – Clerkenwell Road – Old Street corridor from Holborn to Old Street roundabout is one of the most heavily-cycled routes in London (more than 50 per cent of the westbound traffic in the morning peak is bicycles, and 64 per cent at the western end). However, it is busy with other traffic and there is no quiet side-street to use as an alternative route. Fully-segregated cycle tracks will also be difficult here because of the narrowness of the road and the large numbers of bus stops along it. 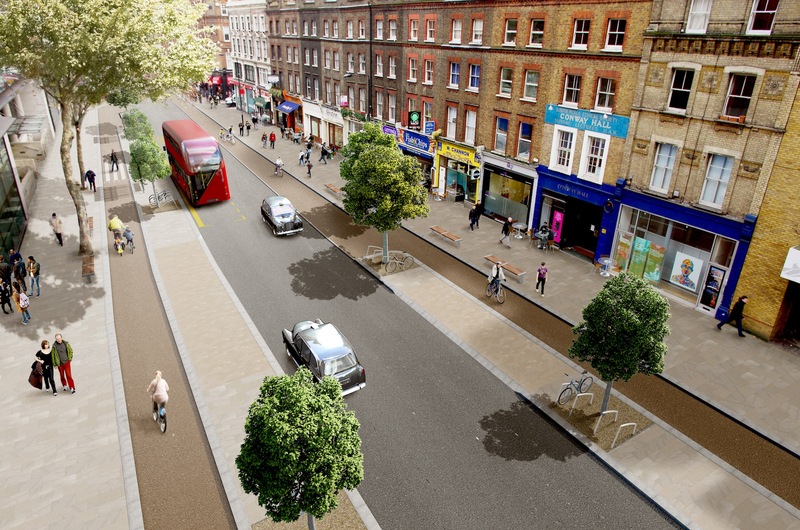 The three councils responsible for the area – Camden, Islington and Hackney – and TfL will undertake a study into how cycle facilities can be safely implemented on this corridor and to address the impacts of traffic. No options have been ruled in or out. 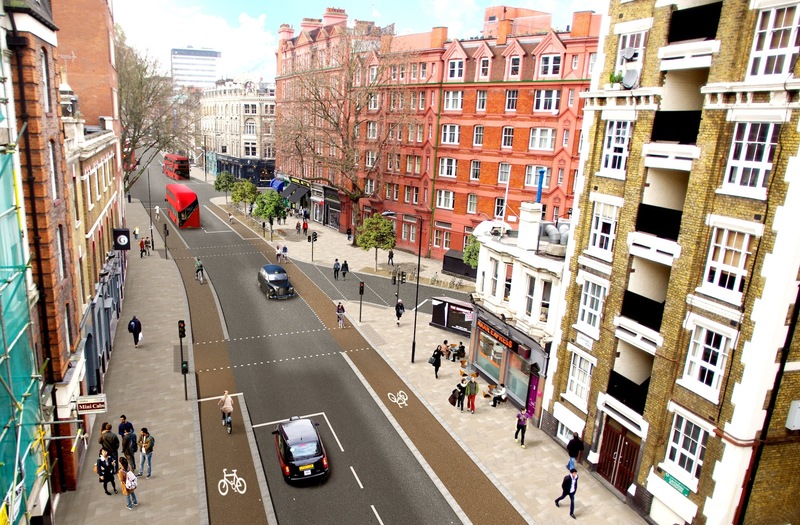 At our meeting in January 2014, Andrea Casalotti described his ideas for Clerkenwell Boulevard a ‘Cycling Boulevard’ from Old Street to Bury Place. Our description of Andrea’s talk provides further links to his ideas. Camden Council generously provided CCC with a grant to enable them to appoint a professional designer to develop a visualisation of our ideas. simple junctions with straight-across pedestrian crossings on all arms; and without islands separating flows of motors. This shows how the road space could be allocated in the central section of Theobalds Road. We are looking eastwards towards the Police Station at the junction with Lambs Conduit Street. On the left we see people cycling in a track with a wide separating island containing a bus stop, cycle parking and trees. The island on the other side of the road comes to an end, while people then cycle on stepped tracks (which will be the norm for the narrower parts of the roads). This is a westbound view across the junction with Rosebery Avenue. It shows stepped tracks on both sides of the road with a single motor lane in each direction. At the junction with Rosebery Avenue, there is a pedestrian crossing on all three arms and the extraneous island between the in and out lanes has been removed. Camden is currently (Spring 2015) carrying out initial studies and stakeholder feedback on transport and public realm project for the Holborn area. The area being studied is contained inside the yellow outline on our map above. An important aspect of the study is to consider how to reduce the impacts of the gyratory where motors run in clockwise direction round Bloomsbury Way, Theobalds Road, Proctor Street, High Holborn and New Oxford Street (red line on map above). As with any one-way system, this tends to benefit motors in comparison with a two-way system in which speeds are lower, making the roads safer for all users. The bus contraflow was installed in 2009 with a view to shortening the eastbound number 38 bus route (and others e.g. 19 and 55) but westbound cyclists were still expected to use the longer and more hazardous route round the gyratory until people were allowed to cycle in the contraflow bus lane January 2014 (see our news item). But as things stand, there is no space for cycling eastbound on Bloomsbury Way although there are two eastbound motor lanes. In addition, some of the westbound bus routes – those heading for High Holborn would have a shorter journey if they were relocated on to New Oxford Street. This road appears to be under used, having capacity for taking some westbound traffic from Bloomsbury Way as well as providing a pair of 2-m wide protected cycle tracks. In preparation for the visualisations, Oliver Davey (UM) made a pair of drawings. We understand that LB Camden gives very high priority to implementing this route and will push for Grid Funding.